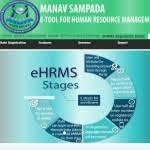 Human Resource Management System application portal to facilitate functioning of all employee details like monitoring, manpower planning, recruitment, promotions, their transfers based on history and skill set, salaries and postings were done manually which causes human errors and lot of time consuming process for Government Employees. It leads lack of skill set and no faith in Government system. To overcome all these issues Government has come up with new initiative system called Manav Sampada. Using Manav Sampada you can do proper manpower planning, recruitment's, promotions, their transfers based on history and skill set and employee salaries very easily and effectively. Manav Sampada is not only efficient human resource tool but it also integrates other government G2G, G2E and G2C services. Manav Sampada is a remedy for all human resource problems of all government employees working in different sections of government . It works as a tool to develop HR related database in comparing the employees work performance and collecting their information like skills, compensation, personal details, demographic information and other detailed relevant information. It is a complete life saver of the government in analyzing the status of manpower by calculating the retirement and recruitment. It helps in creating a benefit management system in summing up the employee allowances and benefits provided to employees using their related insurance and pension plans. It works as a storage system in preserving employees reliable information which is present in manual service book record into electronic form called (e-passbook). It helps both the government and employees to have a cordial relation by making e-passbook easily available in all internet supporting government systems. It is a time saver tool as it reduces lot of manual work in maintaining service book and it decentralizes and timely updation of their transaction. It helps in reaching the objective of RTI act in providing all the information related to government employees without influence of manual power. It Creates a healthy work flow based product and it makes the government Eco friendly as it eliminates paper in various levels of government and thus improves the arbon credit rating of the state by saving paper. It maximizes output from employees in solving their queries at various levels which helps in taking effective decisions on fly.